The key element to any new fan is the volume and speed of any air it can actually move. Some of the early fan blade design work has proven interesting – development continues…. Feb 2016 is nearly over, I had hoped to have a working set of samples by now – but progress has been slow for many reasons, not least of which are the technical difficulties and waiting for modified designs to be laser cut. 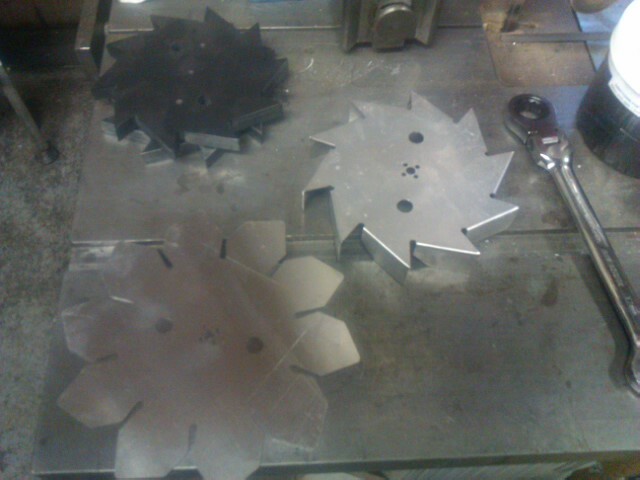 The last set of bits arrived Monday and a further prototype is to be built up this week…. hopefully. 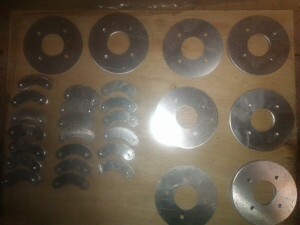 The following image shows the main cooler parts for a single unit – the costs off all these equates to the same as the Fan-C – frustrating as I had hoped to bring it down substantially – after a lengthy talk with the ‘costing department’ at my supplier – it is clear that laser cut holes cost – early days yet though. It is wet with overnight snow outside – wet seams to be the appropriate term for much of this winter season – it has been the wettest winter on record for much of the country (UK) scant little in the way of snow and frost …. not so good for seasonal sales – not much to say on that matter – only to add that I have been giving some thought into boot drying kit for the dog walkers out there ! It also helps to be systematic in pre-coating and not pick up the recently heated aluminium part .. After welding a small section to a finger tip I can confirm its still hot for quite a while – the finger tip will remain without a print for a few weeks I suspect. One of the benefits of making prototypes from scratch is that it throws up all the manufacturing issues which are likely to arise when batch production starts. Most noticeable is the requirement to make jigs & fixtures to enable repeat dimensions to be machined to tight tolerance (typically 0.02mm) and simple things like holding parts to enable machining to take place. More on that in a later post. Alas the lazer cutting firm have been far from fast and I am now awaiting profiles for the next stage of assembly. Fan-c Feedback: If you have not found our Facebook page – do please take a quick look and like it – it all helps spread the word & if you have your own page leave us a comment and like and we will search you out and return the favour. I posted this last night:- ” I get out to meet few folk over the course of a year – one of the downsides of mainly internet based sales. However, those folk that visit the Peak District and fancy a Stove Top Fac-C are always welcome to call in for a brew and a chat … always best to call ahead though … just in case I am off out fishing for trout. A few weeks back a nice gentleman emailed to agree a suitable time for such a chat. He arrived in a series 1 landrover – much admired by me it was. He left some 2 hrs later with a fan-c and full of tea. Just an update on fan. Fits in space nicely. Trying facing out first. Runs fine. Although not been in use for long I think it is a benefit. Room warmer all round at lower stove temperature and I am sure using less fuel. As you say I have loaded one log at a time and had same heat output. I find the power of the fan quite surprising. “I have to say, your fans are incredible. Having ordered one myself just before Christmas time, in truth I thought it was too small to make a difference. We have quite a large room and previously it took literally 3 hours before the back of the room even started to warm up. Boy, was I wrong! Within around 30-40 mins of the stove hitting a sensible temperature, the room was noticeably warmer and the back of the room was beginning to warm up. Fast forward 1hr and we had to open the door and turn the stove heat down. I’m honestly not exaggerating! My Morso badger is burning, ‘Trev’ … The Wonder Dog’ to give him his full title (he also has a facebook page!) is stretched out steaming dry in front of it & I guess I need to get on with more productive work.